[S27] John Wright Boyd, A Family History: Lt. Thomas Fortson (1742-1824) and Some of His Descendants—Early Settler of Elbert County, Georgia (Danielsville, Ga.: Heritage Papers, 1973), p. 281 (attributing information to "Notes on William Gibbs and Family," dated 31 Jan 1970 and provided by Pat Smith to John Boyd) (naming Francis Gibbs as her father). [S27] John Wright Boyd, A Family History: Lt. Thomas Fortson, etc., above, p. 281 (attributing information to "Notes on William Gibbs and Family," dated 31 Jan 1970 and provided by Pat Smith to John Boyd) (naming Sarah Ann _____ as her mother). [S27] John Wright Boyd, A Family History: Lt. Thomas Fortson, etc., above, p. 281 (attributing information to "Notes on William Gibbs and Family," dated 31 Jan 1970 and provided by Pat Smith to John Boyd). [S27] John Wright Boyd, A Family History: Lt. Thomas Fortson (1742-1824) and Some of His Descendants—Early Settler of Elbert County, Georgia (Danielsville, Ga.: Heritage Papers, 1973), p. 281 (attributing information to "Notes on William Gibbs and Family," dated 31 Jan 1970 and provided by Pat Smith to John Boyd). [S27] John Wright Boyd, A Family History: Lt. Thomas Fortson (1742-1824) and Some of His Descendants—Early Settler of Elbert County, Georgia (Danielsville, Ga.: Heritage Papers, 1973), p. 281 (attributing information to "Notes on William Gibbs and Family," dated 31 Jan 1970 and provided by Pat Smith to John Boyd) (naming Francis Gibbs as his father). [S27] John Wright Boyd, A Family History: Lt. Thomas Fortson, etc., above, p. 281 (attributing information to "Notes on William Gibbs and Family," dated 31 Jan 1970 and provided by Pat Smith to John Boyd) (naming Sarah Ann _____ as his mother). [S27] John Wright Boyd, A Family History: Lt. Thomas Fortson (1742-1824) and Some of His Descendants—Early Settler of Elbert County, Georgia (Danielsville, Ga.: Heritage Papers, 1973), p. 282 (naming Margaret Ann Taylor as her mother). [S27] John Wright Boyd, A Family History: Lt. Thomas Fortson, etc., above, p. 282 (naming Alphred James Willis as her father). [S27] John Wright Boyd, A Family History: Lt. Thomas Fortson, etc., above, p. 282. Marriage*: She married Alphred James Willis. [S27] John Wright Boyd, A Family History: Lt. Thomas Fortson (1742-1824) and Some of His Descendants—Early Settler of Elbert County, Georgia (Danielsville, Ga.: Heritage Papers, 1973), p. 288 (naming Margaret Taylor as his mother). [S27] John Wright Boyd, A Family History: Lt. Thomas Fortson, etc., above, p. 282 (naming Margaret Ann Taylor as her mother). Marriage*: He married Margaret Ann Taylor. [S27] John Wright Boyd, A Family History: Lt. Thomas Fortson (1742-1824) and Some of His Descendants—Early Settler of Elbert County, Georgia (Danielsville, Ga.: Heritage Papers, 1973), p. 288 (naming Alphred James Willis as his father). [S27] John Wright Boyd, A Family History: Lt. Thomas Fortson (1742-1824) and Some of His Descendants—Early Settler of Elbert County, Georgia (Danielsville, Ga.: Heritage Papers, 1973), p. 286. [S27] John Wright Boyd, A Family History: Lt. Thomas Fortson, etc., above, p. 286 (stating that they married "about 1884-5, probably in Pulaski Co., Ga."). [S27] John Wright Boyd, A Family History: Lt. Thomas Fortson (1742-1824) and Some of His Descendants—Early Settler of Elbert County, Georgia (Danielsville, Ga.: Heritage Papers, 1973), p. 288. [S27] John Wright Boyd, A Family History: Lt. Thomas Fortson, etc., above, p. 288 (naming Clifford _____ as his mother). [S27] John Wright Boyd, A Family History: Lt. Thomas Fortson (1742-1824) and Some of His Descendants—Early Settler of Elbert County, Georgia (Danielsville, Ga.: Heritage Papers, 1973), p. 288 (naming Joseph Gibbs as his father). [S27] John Wright Boyd, A Family History: Lt. Thomas Fortson, etc., above, p. 288. [S27] John Wright Boyd, A Family History: Lt. Thomas Fortson, etc., above, p. 288 (naming Margaret Taylor as his mother). [S27] John Wright Boyd, A Family History: Lt. Thomas Fortson, etc., above, p. 288 (naming John Franklin Willis as her father). [S27] John Wright Boyd, A Family History: Lt. Thomas Fortson, etc., above, p. 288 (naming John Franklin Willis as his father). [S27] John Wright Boyd, A Family History: Lt. Thomas Fortson (1742-1824) and Some of His Descendants—Early Settler of Elbert County, Georgia (Danielsville, Ga.: Heritage Papers, 1973), p. 288 (naming John Franklin Willis as her father). [S27] John Wright Boyd, A Family History: Lt. Thomas Fortson, etc., above, p. 288 (naming Emily H. Gibbs as her mother). [S27] John Wright Boyd, A Family History: Lt. Thomas Fortson (1742-1824) and Some of His Descendants—Early Settler of Elbert County, Georgia (Danielsville, Ga.: Heritage Papers, 1973), p. 288 (naming John Franklin Willis as his father). [S27] John Wright Boyd, A Family History: Lt. Thomas Fortson, etc., above, p. 288 (naming Emily H. Gibbs as his mother). [S27] John Wright Boyd, A Family History: Lt. Thomas Fortson (1742-1824) and Some of His Descendants—Early Settler of Elbert County, Georgia (Danielsville, Ga.: Heritage Papers, 1973), pp. 288-89 (naming Col. Abram Daniel Burke, C.S.A. as her father). [S27] John Wright Boyd, A Family History: Lt. Thomas Fortson, etc., above, pp. 288-89 (naming Mary ['Millie'] Joyner as her mother). [S27] John Wright Boyd, A Family History: Lt. Thomas Fortson, etc., above, pp. 288-89. Marriage*: He married Mary ('Millie') Joyner. [S27] John Wright Boyd, A Family History: Lt. Thomas Fortson (1742-1824) and Some of His Descendants—Early Settler of Elbert County, Georgia (Danielsville, Ga.: Heritage Papers, 1973), p. 289. [S27] John Wright Boyd, A Family History: Lt. Thomas Fortson, etc., above, pp. 288-89 (naming Col. Abram Daniel Burke, C.S.A. as her father). Marriage*: She married Col. Abram Daniel Burke. [S27] John Wright Boyd, A Family History: Lt. Thomas Fortson (1742-1824) and Some of His Descendants—Early Settler of Elbert County, Georgia (Danielsville, Ga.: Heritage Papers, 1973), pp. 288-89 (naming Mary ['Millie'] Joyner as her mother). [S1108] Social Security Death Index, online at http://tinyurl.com/RootswebSSDI, viewed on 3 Feb 2007. [S603] James Lang, computer file sent to Roger Bartlett, 25 Feb 2001. [S1108] Social Security Death Index, online at http://tinyurl.com/RootswebSSDI, viewed on 3 Feb 2007 (stating that she died in Oct 1976; not naming the place of death but stating that she lived in Brandon, Miss. when she died). 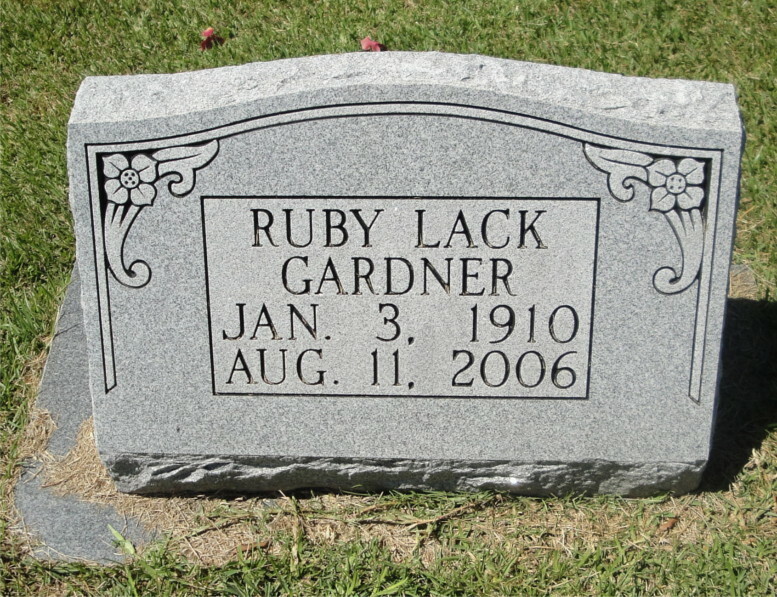 Ruby Lack Gardner's tombstone, Terry Cemetery, Terry, Miss., courtesy of "Betty" on Find A Grave. Other Names*: Ruby Virginia Lack Gardner, Ruby Lack Gardner, Ruby Virginia Gardner, Ruby Lack, Ruby Gardner. [S1370] Jo Ann Gardner Haughton, electronic mail to Roger Bartlett, 19 Feb 2017. [S961] Find A Grave, online at http://www.findagrave.com, memorial for Ruby Virginia Lack Gardner, memorial no. 96791792, viewed on 7 Apr 2017. [S961] Find A Grave, online, above, memorial for John Hilton Gardner, memorial no. 96791898, viewed on 7 Apr 2017. [S1370] Jo Ann Gardner Haughton, electronic mail to Roger Bartlett, 19 Feb 2017 (giving the year but no other information). [S603] James Lang, computer file sent to Roger Bartlett, 25 Feb 2001 (naming Ruby _____ as her mother). [S1370] Jo Ann Gardner Haughton, electronic mail to Roger Bartlett, 19 Feb 2017 (naming Ruby Virginia Lack as her mother). Other Names*: Bobbie Lois Gardner Fisk, Bobbie Gardner Fisk, Bobbie Lois Fisk, Bobbie Gardner, Bobbie Fisk. • Her Find A Grave memorial, which includes her obituary and pictures of her grave markers, is here. [S603] James Lang, computer file sent to Roger Bartlett, 25 Feb 2001 (naming John Hilton Gardner as her father). [S1370] Jo Ann Gardner Haughton, electronic mail to Roger Bartlett, 19 Feb 2017 (naming John Hilton Gardner as her father). [S961] Find A Grave, online at http://www.findagrave.com, memorial for Bobbie Lois Gardner Fisk, memorial no. 138473400, viewed on 7 Apr 2017. [S603] James Lang, computer file sent to Roger Bartlett, 25 Feb 2001 (not giving the date). [S961] Find A Grave, online, above, memorial for Bobbie Lois Gardner Fisk, memorial no. 138473400, viewed on 7 Apr 2017 (not giving the date but stating that they had been married fifty-one years when she died in Nov 2014). [S961] Find A Grave, online, above, memorial for Rev. John Wadsworth Fisk, Sr., memorial no. 46880181, viewed on 7 Apr 2017 (not giving the date). Rev. John Wadsworth Fisk Sr.
• His Find A Grave memorial, which includes his obituary and a picture of his grave marker, is here. [S961] Find A Grave, online at http://www.findagrave.com, memorial for Rev. John Wadsworth Fisk, Sr., memorial no. 46880181, viewed on 7 Apr 2017. [S312] Social Security Death Index, online at http://tinyurl.com/AncestrySSDI, viewed on 20 Apr 2003. [S312] Social Security Death Index, online at http://tinyurl.com/AncestrySSDI, viewed on 20 Apr 2003 (stating that he died in Jan 1993; not naming the place of death but stating that he lived in Scott, La. when he died). [S312] Social Security Death Index, online at http://tinyurl.com/AncestrySSDI, viewed on 20 Apr 2003 (stating that he died in Apr 1982; not naming the place of death but stating that last benefits were sent to an address in Orlando, Fla.). [S831] Barbara Norris, electronic mail to e-mail address, 16 Mar 2003, (naming Daniel Ohlinger/Olinger as his father). [S832] Marvin Langston, electronic mail to e-mail address, 17 Mar 2003, (naming Daniel Olinger as his father). [S831] Barbara Norris, electronic mail to e-mail address, 16 Mar 2003, (naming Maria M. Zirkle as his mother). [S832] Marvin Langston, electronic mail to e-mail address, 17 Mar 2003, (naming Maria Magdalene Zirkle as his mother). [S831] Barbara Norris, electronic mail to e-mail address, 16 Mar 2003. [S831] Barbara Norris, electronic mail to e-mail address, 16 Mar 2003, (naming Daniel Ohlinger/Olinger as her father). [S832] Marvin Langston, electronic mail to e-mail address, 17 Mar 2003, (naming Daniel Olinger as her father). [S831] Barbara Norris, electronic mail to e-mail address, 16 Mar 2003, (naming Maria M. Zirkle as her mother). [S832] Marvin Langston, electronic mail to e-mail address, 17 Mar 2003, (naming Maria Magdalene Zirkle as her mother).